Whether your horse is a performance horse or a back yard pet, they can develop lameness issues which affect their performance, comfort, and soundness. As they can not tell us in words where the source of discomfort is emanating from, it is up to us to determine where the area and source of lameness arise. 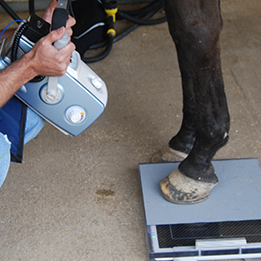 This is done through a systematic equine lameness examination. The first step is visualization of the horse. Assessing for abnormal wear of the shoe or hoof. Looking for areas of swelling. The Second step is Palpation and Manipulation. Palpating tendons, ligaments, and joint capsules for swelling or pain. Flexing joints one-by-one. (Flexion Tests). The third step is diagnostic anesthesia (nerve blocks or joint blocks). Using appropriate nerve blocks can help localize the causative area. We begin low in he heel and work our way up the affected limb. Radiographs (X-Ray images) and Ultrasound can be used to diagnose the cause, structures affected, and help determine prognosis and medical treatments. We use a portable digital radiography system from Sound Eklin, a leader in digital radiography.